Gå rundt i Beijing's kejserlige parker og 'hutongs' (gamle kvartaler) på denne private 7-timers tur. Klatre Jingshan Hill for panoramaer over Den Forbudte By, og udforske de kejserlige haver i Beihai Park. Rid en båd her (kun april til november), og nyd en kejserlig frokost i Beihai's Fangshan restaurant. Du kan også besøge et familiehus på en guidet tur rundt om hutongerne og se en trommeslagsceremoni på Trommeltårnet. Hotel afhentning og drop-off inkluderet. Ok- this tour was just wonderful fun and the lunch was amazing. Our tour guide, Angie, made the day. Her English was perfect - her pace for the day just gave us time to enjoy our surroundings and relax. Would do the tour again -- provide Angie was the guide. This was a wonderful tour by a fabulous tour guide. Colin is so knowledgeable about Beijing and his English is perfect. 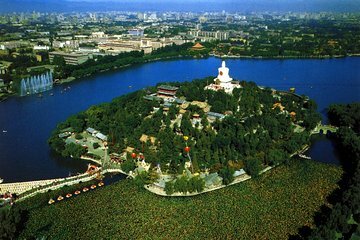 I booked this tour because I wanted to see some parts of Beijing I hadn't yet seen, and get some exercise while doing so. I liked the idea of a tour with lots of walking. The added bonus was everything I learned with Colin leading the way! Jingshan Hill and Beihai Park were both beautiful and the Imperial Lunch was plentiful and delicious. My favorite part of the tour was the Hutong. Seeing this hidden gem was the highlight of my trip!